The M1A1 155 mm howitzer was a towed howitzer used by the United States Army. It was first produced in 1942 as a medium artillery piece under the designation of 155 mm Howitzer M1. It saw service with the US Army during World War II, the Korean War, and the Vietnam War, before being replaced by the M198 howitzer. The gun was used by the armed forces of many nations, including Afghanistan, Argentina, Austria, Brazil, Cambodia, Cameroon, Canada, Chile, Republic of China, Croatia, Denmark, Germany, Ecuador, France, Greece, Iran, Iraq, Israel, Italy, Jordan, South Vietnam, South Korea, Lebanon, Libya, Norway, Netherlands, Pakistan, Philippines, Portugal, Saudi Arabia, Singapore, Spain, Thailand, Turkey, Venezuela, Vietnam, and Yugoslavia. One hundred sixteen surplus howitzers were sent to Bosnia in 1997. In some countries the M114 still remains in service. 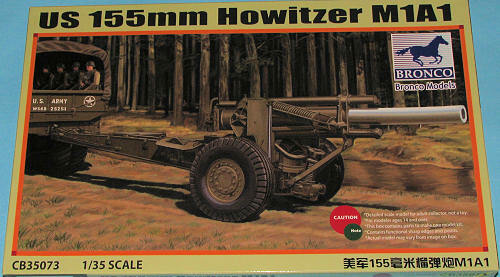 Bronco has provided us with another fine piece of towed artillery with the release of this 155mm howitzer kit. I was surprised at how long lived this piece was when I looked up the history of it. 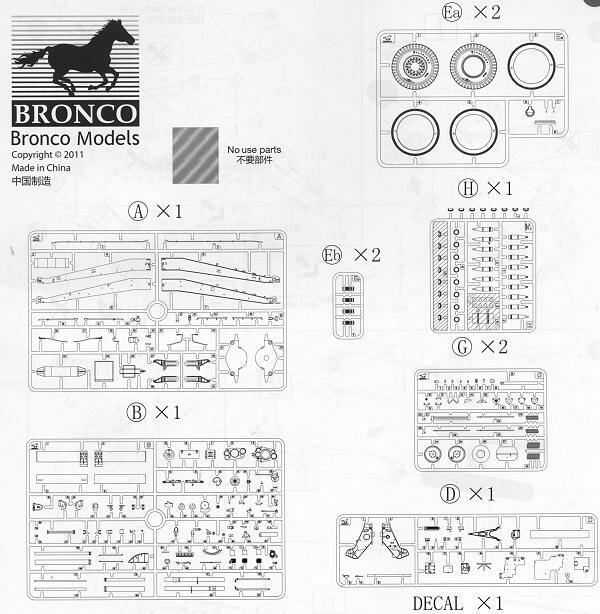 Typical of Bronco kits, there are quite a few parts and this is due to the amount of detail provided in the kit. Something that seems to be a sort of trademark is that there are areas along seam lines that have no bolt detail. This is to be added later by removing this detail from the appropriate sprue runner and adding it where appropriate. Now some modelers think that this is a bit much, but really, it is very time consuming to remove the mold seam from something as small as a bolt head or nut and thread. The kit provides options in that one can have the breech open or closed and one can build the kit in the firing or towing configuration. Several parts are designed not to be glued so that one can move the gun in azimuth and elevation. The recoil mechanism is also something that can be adjusted, so you can portray the gun as having just been fired and ready for another round. Photo etch is part and parcel of pretty much every Bronco kit I have seen and this one is no different. This one comprises of only 11 parts so is not one of those overwhelming additions to kits one can fine. These parts are quite small and used for things like braces, brackets, and on the azimuth and elevation controls. I was especially impressed by the detail on the recoil springs. These are superbly molded and not solid as one would find on some other kits. There are two sets with one set designed to be inserted within the other. Wheels are those that are designed in sections with several sections making up the tire alone. The kit also comes with a wide selection of shells. In fact, the decal sheet provided is pretty much just for marking the shells. The gun itself is unmarked and pretty much overall olive drab, though one can paint the barrel either aluminum or OD. Bronco's instruction booklet is superbly done without cramming too much into a small area as one finds with some others. It clearly shows what goes where and provides good placement information with regard to sub assemblies and their relation to the overall model. I am a fan of towed artillery and this one is just superbly done. Anyone building this kit will end up with a fine model. If your tastes run towards this sort of subject, then this one should be on your must have list. Thanks to www.dragonmodelsusa.com for the preview kit. Get yours today at your local hobby shop or have them order one for you.